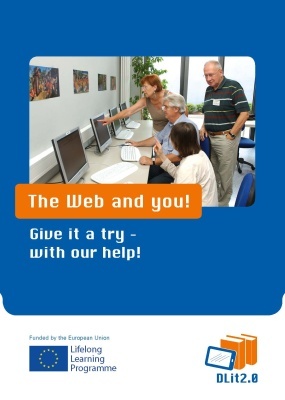 "Digital Literacy 2.0" is a European project funded in the Lifelong Learning Programme that aims to help you use Web2.0 applications in your everyday life. ... and a whole lot of other things. The online world penetrates more and more the daily life of European citizens and therefore Digital Competence or Digital Literacy has become one of the key competences to ensure social cohesion, active citizenship and personal fulfillment. Citizens who do not have access and skills needed to use the internet are disadvantaged in many ways. Since educational disadvantage is closely linked to social exclusion and poverty there is a need to empower the really "hard to reach" learning distant groups and to enable them to make use of ICT. The project Digital Literacy 2.0 (DLit2.0) follows an ICT based train-the-trainer and qualify-the-users approach. It sets out to develop and implement training programmes for staff in non- and informal learning settings such as Public Libraries, community and care centres to enable them for the use of Web 2.0 and the provision of ICT based non-formal learning offers to socially disadvantaged and learning distant people. Once they are trained, these staff members will enable new users of the Internet to develop skills and knowledge needed to make full and safe use of the World Wide Web improving their motivation to learn and empowering them to participate in social life. Especially Web 2.0 provides plenty of learning opportunities and lowers the threshold to education. DLit2.0 analyses best practices strategies and success criteria from different European countries into one comprehensive and innovative strategy with special emphasis on innovative non-formal learning approaches and collaboration models. The project is a transnational, transsectoral and interdisciplinary cooperation and creates value by basing growth on knowledge, empowering people in inclusive societies and ensuring that citizens can access lifelong learning and up-skilling throughout their lives in order to master "New Skills for New Jobs".